50 small allergen- and gluten-free vegan treats! Just before her son Ethan’s first birthday, Viviane Nguyen found out that he had about thirty severe allergies. Much research led her to realize that, unfortunately, no bakery in Canada or even in the United States could produce a birthday cake free of the allergens that put her son’s life in danger. 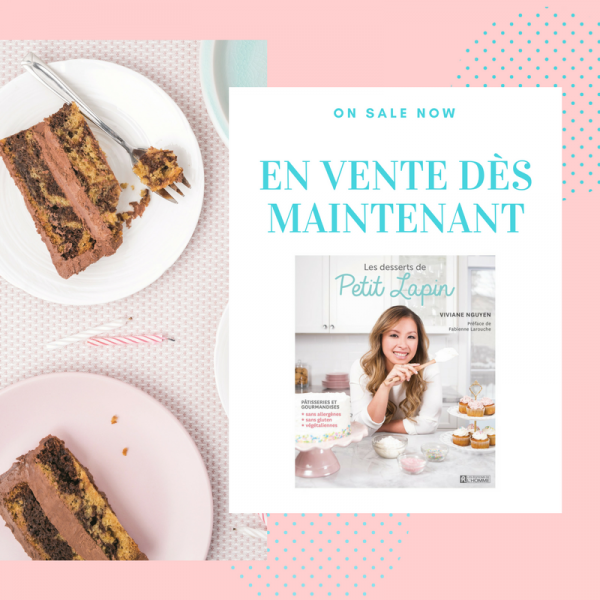 This caused her to throw herself into a marathon of experiments culminating in the creation of her own pastry recipes and the founding of Petit Lapin, the first bakery to offer vegan desserts without gluten and containing none of the 10 top allergens (peanuts, eggs, milk, nuts, wheat, soy, sesame, etc.). In this book, Viviane tells us her story and, most importantly, teaches us tips and tricks for baking allergen-free pastries at home. Breads, muffins, madeleines, macaroons, cookies, donuts, cupcakes and, of course, birthday cakes – in a simple, straightforward way, she shares more than 50 foolproof recipes, made with simple and delicious ingredients so that everyone who suffers from food allergies can fully enjoy the best desserts, safety guaranteed!